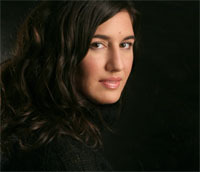 Leilah Nadir is an Iraqi-Canadian who grew up in England and Canada with a Christian Iraqi father and an English mother. She has a Master's degree in English Literature from the University of Edinburgh and a Joint Honours Bachelor's degree in English and History from McGill University. She has worked in London and Vancouver in the publishing industry. Since the invasion of Iraq, she has written and broadcast political commentaries for the CBC, The Globe and Mail, and the Georgia Straight, and published a feature article in Brick magazine. She lives in Vancouver, British Columbia, with her husband. Farah Nosh graduated in 2002 from the Western Academy of Photography in Victoria, British Columbia. Her portfolio from Iraq includes the last months of the former Iraqi regime until July 2004. Nosh has also worked in Lebanon, the West Bank and Gaza, Afghanistan, Pakistan, Syria, and is based in New York. Nosh's clients include: TIME Magazine, LIFE Magazine, The New York Times, National Geographic Traveler, The Walrus Magazine. In 2006, TIME chose her photograph of her Iraqi family as one of the year's best photographs. See Farah's work at www.farahnosh.com. Born to an Iraqi-Christian father and a British mother, and raised in Britain and Canada, Leilah Nadir has never set foot on Iraqi soil. Distanced from her Iraqi roots through immigration and now cut off by war, the closest link she has to the nation is through her father, who left Baghdad in the 1960s when he was sixteen to pursue his studies in England. He never looked back, until now, through his daughter's journey to uncover her lost family roots. Her father’s most vivid memory is of the garden at the family house: the rosebushes that lined the walls, the date palm that intermingled with the palm fronds, and the orange tree that hung over the roses. His Iraq is of mythical origins; his beginnings are in a garden. But through her cousins still living in Baghdad she experiences the thunderous explosions that continuously rain down upon the country today, and describes losing their great-aunt in the terrifying aftermath of the invasion. 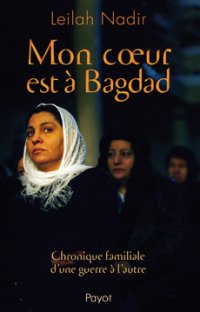 Leilah’s friend, photographer Farah Nosh, brings home news of Leilah’s family after her visits to Iraq, as well as stunning photos ofciviliansand their often tragic stories. And just as Leilahgives up hope of ever meeting her family, a surprise reunion takes place. 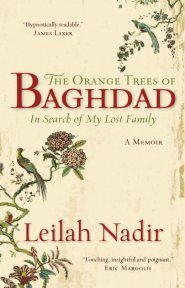 The Orange Trees of Baghdad is at once harrowing, touching, and painfully human. An unforgettable debut.